The media has since dubbed them as the “anti-Brotherhood, anti-military” group. This general call against a government that either the Muslim Brotherhood or the military dominates is much a continuation of Egypt’s past. 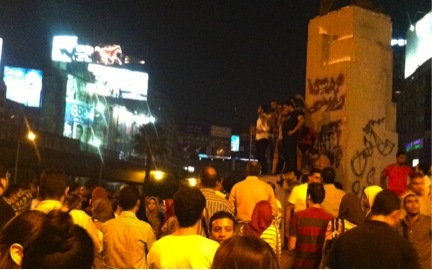 Only two weeks after Morsi was driven out of power in July did a “Third Square” emerge in Cairo. The long, hot, tense summer in Egypt’s capital divided along two squares. The Muslim Brotherhood occupied the area outside of Rabaa Mosque in Nasr City, whereas almost all other protesters remained in Tahrir Square, the heart of the original revolution. 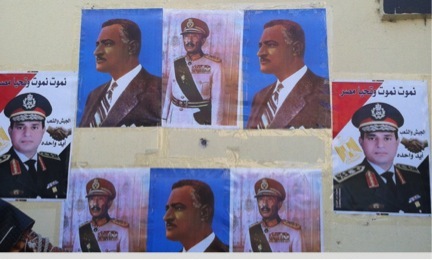 Protesters at Tahrir quickly embraced the Egyptian Military, and photos of General Abdel Fattah el-Sisi permeated deep into the old alleys of the city. In reaction to dueling rallies and the continuous brawls between these two camps, the Third Square movement began to demonstrate in Sphinx Square. The filmmaker Ahmed Sherif produced “Resist,” (https://www.youtube.com/watch?v=t9pPijKhnpE) a music video intended to goad “Couch Party” members (those citizens who sat on sofas while political events continued to become more deadly) to prevent either side from having absolute power. It was the Third Square movement itself that fragmented into nothingness. Elham Magdy, an Arabic teacher from Giza, attended protests at the Third Square since the very beginning. “Everything here has stopped,” she said, when asked about recent protests at the Third Square. The “Road of the Revolution Front” has admirable goals, but analysis of the Third Square’s failure to mobilize people reveals the uphill challenges the new group faces. They must be highly organized or risk the same fate as the Third Square. Leaders of the front should appeal to the labor movement, the most highly organized group in Egypt (apart from the Muslim Brotherhood). They must also have specific objectives in order to unify against attacks from those who support the military. The political group’s call for an “Egyptian Bill of Rights” will be a strong, initial campaign to gain influence. However, the ”Road of the Revolution Front” must inspire the millions of disenchanted Egyptians to return to the streets if they hope to push the country back onto the path of democracy.